We are officially launching the ELIA Frames Font to the World! After years of preparation, we are introducing ELIA Frames through a Kickstarter campaign and a Cooper Hewitt Smithsonian museum exhibition. In advance of those efforts, we have been engaging our community – i.e. YOU! Please be ready share our Kickstarter, and if you like the campaign’s rewards, support us. We will need your help. With it, this will change the world! Our Kickstarter Campaign will serve as an official introduction of the ELIA system to the world. Funds will go to printing and shipping out ELIA Starter Kits to individuals and organizations eager to practice reading and gain new independence. Users will learn the ELIA Frames Font, label their homes, and gain independence through our starter kit. We are working with creatives Jesse Reed and Hamish Smyth from the design office Order. Paired with the museum exhibit, we are enthusiastic about engaging the early adopters and innovators who congregate on the Kickstarter crowd funding platform. This campaign is a vehicle for developing our community, and we are looking for your support and feedback! Sign up below for notification of ELIA's Kickstarter launch! Low Vision user reading the ELIA Learning Manual. Prepare to experience ELIA for yourself at the Smithsonian Cooper Hewitt Museum in New York City. We are excited to be part of the upcoming exhibit at “America’s Design Museum”. Come learn the alphabet, discover why and how it was developed, and witness “The Senses: Design Beyond Vision”. Other notable contributors to the exhibit include the San Francisco Light House, Petra Blaisse, Bruce Mau, Malin+Goetz, and many more. This exhibition was developed by Ellen Lupton and Andrea Lipps. Learn more about the Cooper Hewitt exhibit. The show will run from April 13, 2018 to October 28, 2018. Don't miss it! ELIA Life launched a pilot program through which we’ve begun teaching the ELIA Frames Alphabet and helping blind people use it in their daily lives. Our first participant, Thomas Reid, has learned ELIA and has been reading with it. He’s been providing us with feedback and advice about the presentation and content of program's reading material. We’ve also been interviewing him about his daily life and how we might be of assistance. We are currently recruiting new participants. If you would like to be a part of the pilot, please let us know. On the recommendation of Dr. Alan Morse of Lighthouse Guild, the American Academy of Ophthalmology (AAO) invited ELIA Life Technology to present our new TouchPrinter and ELIA Frames alphabet at the 2017 AAO International Conference (held this year in New Orleans). As a result of the presentation, we enlisted the support of several members of the vision rehabilitation community. They include Dr. Linda Lam of USC’s Department of Ophthalmology and Rob Nevins, a board member of the Canadian National Institute for the Blind (CNIB). Andrew Chepaitis, about to address the crowds at the AAO Conference, New Orleans. The company also applied for and was chosen to participate in a showcase of startups from the FutureWorks incubator program, in which ELIA Life Technology took part this year. We got the word out, meeting investors, potential hires, and other interested stakeholders associated with the hardware startup community in New York City. 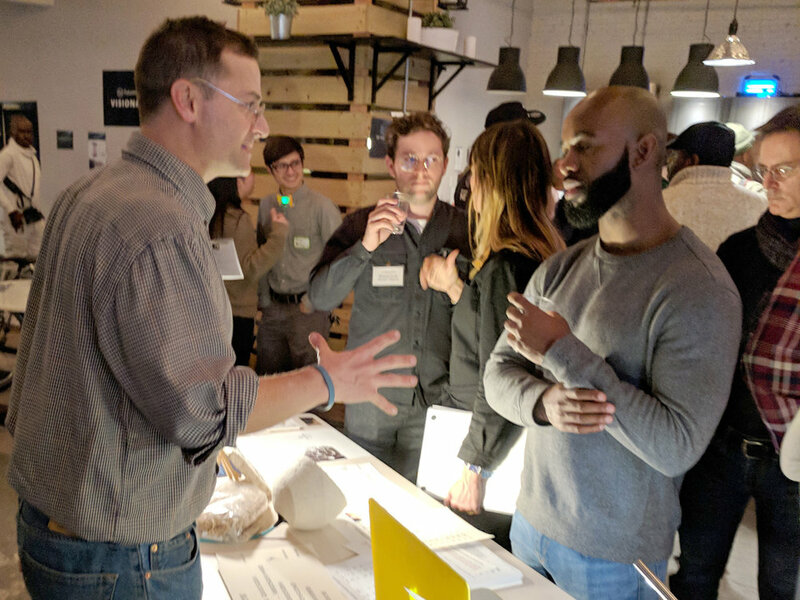 Through FutureWorks, ELIA gained expertise and connections in the hardware space this fall. These connections will be helpful as we launch the TouchPrinter, develop and prototype subsequent products, and build out our team. The investors we met there have also been supportive and interested in our initiatives. Andrew Chepaitis of ELIA discusses tactile printing at the Electropositive Event. The ELIA Bookmarks are back in stock. We originally ordered 2,500 as a way to showcase the alphabet. We gave them away at conferences to people who signed up for our newsletter, and to people we met while networking. After the Fast Company article, people began ordering them from our website and ordered the last of our stock. So we ordered another 2,500. They are one-of-a-kind. The Center for Book Design said that few letterpress professionals could have created them, but ours can. With a smooth two-color print finish and beveled corners they are the best bookmarks you’ll find. And with them, you can introduce people to the ELIA Frames alphabet. Order yours now while they last. New tactile, letterpress bookmarks are freshly printed and now available! For the fall 2017 semester, we were fortunate to employ Isabela Caetano as an engineering intern. Isabela is an electrical engineering student at the Rochester Institute of Technology, where she is the recipient of a Bill and Melinda Gates scholarship. This semester, Isabela advanced several engineering efforts, including our ELIA keyboard prototyping and ELIA Frames stencils. She also collaborated with us on organizational efforts to prepare for our spring Kickstarter and events throughout the fall. And she generally pitched in across the company, including establishing daily and weekly productivity and wellness practices. This was Isabela’s second internship at ELIA Life. We recruited her through the national STEM educational organization called MOUSE, from which we have worked with six interns. We expect to utilize the efforts of interns on an ongoing basis. We’ve developed and adopted best practices to get better at hosting and leading them to productive stays with us. ELIA's Andrew, Byron, and Isabela overseeing prototyping activities. Fast Company awarded ELIA Life Technology two honorable mentions in their 2017 Innovation in Design Awards for the categories Graphic Design and Social Good. ELIA was also featured in their article “The Complicated Quest to Redesign Braille” last week. The piece touches upon braille advocates and their skepticisms of ELIA Frames, and features Thomas Reid, a vision loss advocate who quickly became fluent in ELIA Frames. Byron Johnson has joined the ELIA Life team to help manage our Research and Operations efforts. He recently completed his graduate studies in Behavioral Neuroscience (BN) at Queens College (CUNY), and will lead the company’s basic research efforts, including curriculum development. He will also have a role in operations, including preparations for an upcoming Kickstarter, ELIA keyboard testing and data analysis, and grant writing. The lead graduate student in his lab, Byron came highly recommended by his graduate advisor, Andrea Li, Ph.D.
ELIA Life Technology has been chosen for membership in the 2017-2018 programs for the NEW INC design incubator and the FutureWorks hardware incubator. Through these organizations, the company has access to cutting-edge prototyping and fabrication facilities, as well as more traditional facilities and equipment. Speaker and networking events, investor pitch presentations, as well as professional development and mentoring are also part of the two programs. Strategic planning, marketing, PR, and graphic and video design services will also be available. Kickstarter/Hackaday Presentation and Discussion ELIA Life’s Andrew Chepaitis presented the keynote address at Kickstarter ‘s World Maker Faire week meetup with their hardware community partner Hackaday. The presentation shared the ELIA Frames Alphabet and our new TouchPrinter with the group, and was a great opportunity to answer questions, discuss our approach. and discuss new opportunities for collaboration. Kickstarter has also invited us to launch a fundraising campaign for the ELIA Frames Alphabet, where they will provide guidance through Futureworks. Several ELIA advisors have led successful Kickstarter campaigns and will collaborate with us to ensure that we achieve success. ELIA CEO Andrew Chepaitis presenting to the crowd at the Kickstarter Hackaday event. ELIA Life exhibited at this year’s 8th annual World Maker Faire New York at the New York Hall of Science. In a booth space sponsored by Futureworks, our team provided ELIA Frames and TouchPrinter demonstrations for thousands of inventors, technologists, and science enthusiasts. 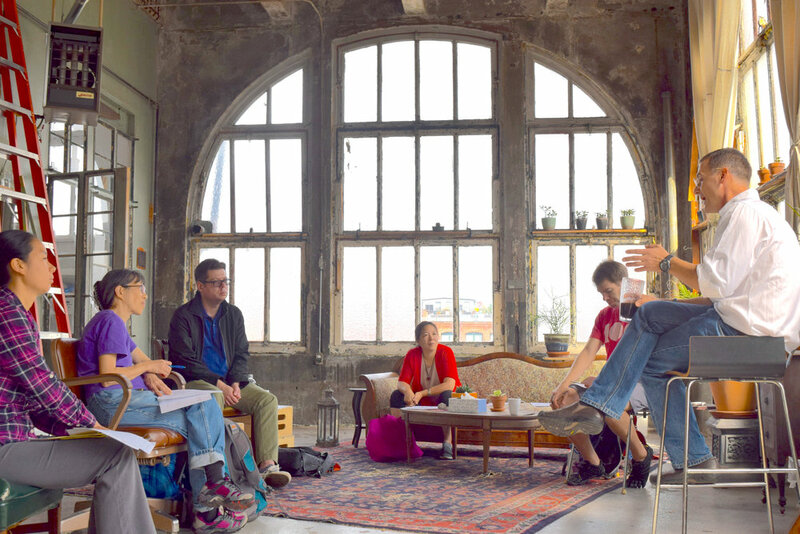 ELIA's CEO Andrew Chepaitis was interviewed by the MAdE Podcast, a media collective that places making, architecture, design, and equity at the forefront of their stories. ELIA CEO Andrew Chepaitis being interviewed for MAdE podcast. The NYC ELIA Life Technology Team met with representatives from the Brooklyn Public Library where they shared helpful information on library engagement, usability issues, and universal access to texts. Our goals are to form collaborations with the library and affiliated organizations, and to ensure that we are providing content efficiently. Ultimately, we wish to launch pilot programs at libraries for people to learn and read ELIA Frames, and conduct an ELIA Keyboard study. We will share progress as those efforts move forward. ELIA CEO Andrew Chepaitis hosting a UX Meetup group. ELIA is excited to announce that The ELIA Frames Alphabet has been selected for inclusion in Cooper Hewitt’s upcoming Exhibition of the Senses in April 2018. Located right here in Manhattan, Cooper Hewitt, Smithsonian Design Museum is the only museum in the nation devoted exclusively to historic and contemporary design. To share our innovative tactile alphabet with the world at Cooper Hewitt is quite an honor, and we will provide details about the exhibit as the date approaches. We hope to see you there. Since we last wrote, ELIA’s CEO Andrew Chepaitis was invited to participate in a panel discussion regarding Design and Disability at the Soho House in Manhattan. An interesting conversation, Andrew shared ELIA’s approach to solving complex problems related to disability. Also a challenging talk, Andrew described and defended ELIA’s process of qualitative and quantitative interviews and data analysis. ELIA also exhibited at Techcrunch Disrupt NYC, where we demonstrated our TouchPrinter and ELIA Frames alphabet to throngs of attendees. There was much enthusiasm for our products and our mission, and we continued to forge relationships with potential customers and collaborators. A pleasant surprise was the variety of corporate service partners in attendance - we struck up relationships with SalesForce.com (for customer relationship management software), Topcoder (for game and app development), NetCapital (for fundraising), and Unum Provident (for a possible long-term disability insurance partnership where ELIA could help them better serve their claimants). We’ll be following up on those conversations and would be glad to share additional information with you. If you have suggestions regarding corporate partnerships, please let us know. ELIA was recently chosen for inclusion in Futureworks, a product-hardware incubator in NYC - we were one of just a dozen companies chosen from over 100 applicant organizations. The program provides access to state-of-the-art machinery and hardware-building expertise throughout NYC. We expect to leverage its resources to build better products faster and for less cost. We are excited to share with you the major developments at ELIA Life Technology, and every quarter, we will be providing additional details about our progress and work (or more frequently, if possible/necessary). In the meantime, please feel free to contact us for further information or suggestions. Our main news, which we are very excited about, is that we are completing development of the world’s first tactile graphical printer, called the TouchPrinter. Now that people have the ability to print and read the ELIA Frames Alphabet in their own homes, classrooms, and workplaces, we can formally launch ELIA Frames and promote its adoption. Users will also be able to print tactile graphics – charts and graphs, maps and diagrams, presentations that include text and graphics, etc. Read the update to learn more. ELIA Frames has always offered the 8.4 million people in the U.S. who have a visual impairment the possibilities for greater education, employment, literacy, and independence. And it has the potential for widespread adoption because it is merely a new design of the standard alphabet, which 99.9% of people in the U.S. know and have read. But launching ELIA Frames formally, without a means for readers to produce it themselves, is dangerous. We witnessed this first hand after our last research study, where we taught blind people to read ELIA Frames. They were enthusiastic to continue reading it, but after we had completed the funded training and testing, we could not keep up with their demand for reading materials, as the grant research had been completed. Clearly, our ELIA Frames readers needed a way to print their own tactile materials. ELIA Life Technology has created the world’s first tactile graphical printer. Now, any document or image can be printed in tactile form. For the first time, the blind will have access to the same printed graphical information that the sighted have. This will open up opportunities for them to study STEAM subjects, (science, technology, engineering, art, and math). In 2014, the company was awarded a $1.2 million grant from the National Institute on Aging (part of NIH) to develop a tactile graphical printer. Through the grant, the company has successfully created a printer that can print any image or document in tactile form. The technology utilizes Hewlett Packard inkjet printer technology and a specially coated paper, and ELIA Life Technology has an exclusive license from Hewlett Packard to use their printing technology in the printer. Our research and development team integrated Hewlett Packard ink jet printer components, off-the-shelf electronic and mechanical components, and custom hardware and software to ensure that the printer prints consistent output, output that meets the US Library of Congress standard for tactile print production. Because the printer leverages inkjet printer technology, any content that one can print with an inkjet printer can now be printed tactilely. The tactile printing technology has been de-risked and a working prototype has been created. As is, it could be mass-produced. Indeed, we have four of identical units ready for field-testing. Remaining efforts before commercialization include final usability testing, and the fabrication of a final production-ready prototype, which will be sent to the Underwriters Laboratory for UL testing and certification. Once those activities are complete, production, operations, and sales will begin. To all of our supporters, thank you for taking the time to read our inaugural newsletter. We will continue to share with you developments at ELIA Life Technology in order to keep you up to date on issues such as research and development, financial interests, legal news, and other activities. I encourage you to reach out to me with any questions you may have.